The latest exhibition of well-known artist Farouk Hosny will open at Cairo’s Picasso Gallery on 3 February. 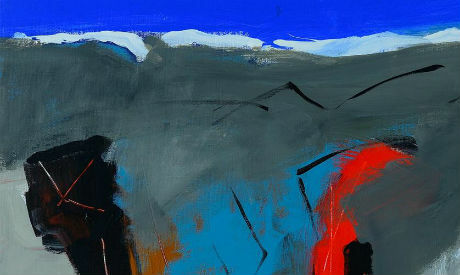 His minimalist, abstract style is recognizable, as his works are shown regularly in Egypt and internationally. The exhibition text describes his work as vivid, abstract, calligraphic gestures that capture Egypt’s landscape and icons. “The blacks of sudden nightfall, the blues of sea water, the whites of limestone, the violets of the Sinai mountain range, the burning ochres of the desert, the green of the flowing Nile, the grays of ancient stones, and the oranges of flaming sunsets,” the text reads. Hosny’s works have been showcased in several international museums such as the Metropolitan museum, Houston museum of Fine Arts, Fort Lauderdale in Miami, the National Museum of Vienna, le Vittoriano Museum in Rome, Carrousel du Louvre in Paris, Tokyo Art Museum, in addition to several Arab and Egyptian Museums. He also held several solo exhibitions in Dubai, where he moved following the outbreak of the 25 January Revolution in 2011. He was appointed Minister of Culture by former president Hosni Mubarak in 1987, and held the position until 2011.